At last week’s meeting of my Solo Seniors support group, the discussion turned to the topic of social isolation. As elders without spouses and mostly without children and nearby family, the members of our group are at risk for social isolation, and social isolation is a predictor of negative health outcomes and earlier death. But how can we protect ourselves from social isolation? One member of our group has chosen to live with a housemate as a buffer against social isolation. But what about those of us who choose to live alone? Are we doomed to social isolation? Some researchers have used living alone as a measure of social isolation, but it is not a good one. The opposite of social isolation is not living with others; the opposite of social isolation is social engagement, and those who live alone can be quite socially engaged. I consider myself a good example. I have lived alone for more than forty years, but I did not become socially isolated when I stopped going to work every day. If anything, I’m feeling a bit too socially engaged at this point in my life. With activities as diverse as my garden club, Master Gardener volunteer projects, horticulture courses at the Coastal Maine Botanical Courses, service on my town’s Conservation Commission, teaching and taking classes at the Senior College, choral singing, my retirees’ book group and my solo seniors group, and with the need to nurture friendships arising from each of those activities, I often find myself without as much time as I’d like for the solitude that nourishes me. Looking for some clipart to illustrate this post, I did a browser search for both “social isolation images” and “social engagement images.” Both searches produced the same set of results, images focused on social media. These search results suggest that the internet and active participation on social media platforms like Facebook and Twitter might provide a way for those most vulnerable to social isolation, those who live alone and are largely house-bound, to be socially engaged. Most members of our group considered this model of virtual social engagement suspect. It seemed to us that for social engagement to be an effective antidote to social isolation, it must include face-to-face interaction with people that you can count on for support, both logistical and emotional. Some people have one or a very few people, often spouses and adult children, that they rely on for these types of support. Those of us aging alone usually need a larger support system; we rely on a network of supportive friends and relatives. One of the most telling signs of isolation is not having someone you can turn to for help during a crisis—for example, someone to help with shopping or to get you to medical appointments during an illness. Evidence that social media participation doesn’t usually fill this need can be found in the Facebook Elder Orphans group. Some of the most active participants in that group have expressed their sense that they have no one they can turn to for this kind of help. One of the reasons that I am happy to be finding so many new friendships at this stage in my life (aside from the pleasure those friendships bring) is that a larger friendship network increases the probability that I’ll be able to find someone (or several someones) in my network to provide the logistical and emotional support I need. As we discussed all this in the Solo Seniors group, one member turned to the rest of us and asked if we could commit to providing this kind of support for one another. “Yes!” came the chorus of responses; we could. I always enjoy seeing your posts come up in my feed. I have managed to create myself some social circles that, like yours, are satisfying. However, I get the whole sense of isolation because I have no one I can turn to for a ride to the med station or other minor crisis. (The others have adult kids and grandkids to turn to for that.) And to make it more complicated as we age, all those friends I’ve managed to network into a social life are getting older and more restricted when it comes to driving, so there’s a sense that we’ll fall apart in a few years. Most of us already don’t drive at night or downtown or on expressways. Thanks for the reminder about Elder Orphans. I just found a group in West Michigan. Jean, I hope the Elder Orphans group turns out to be congenial and to be interested in this kind of practical mutual support. My sense is that the members of the larger Facebook group are divided between those interested primarily in practical support and those interested primarily in emotional support. This is all so true. The seniors here in Hillsboro, as well as neighboring Henniker, seem to have developed a tight-knit group, with resources available for things like medical rides, grocery trips etc., younger members and friends providing much support. It would be wonderful if all towns and cities, particularly those little towns in isolated areas, could develop the same. Sue, I’d love to learn more about how these groups were formed and how they got the younger members interested. One of the problems many of these groups face is that younger people who don’t need much support want to distance themselves from the idea of being old and do not join. 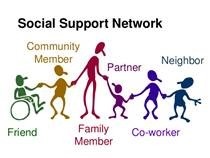 One model that has worked in some areas (mostly urban) is a “village” model in which members pool resources to hire some of the support they need. Meet-Up is an effective tool for finding an amazing variety of local groups that have face-to-face activities. John, Thanks for the tip about Meetup.com. I particularly like the option to use the site to start a group if you don’t find one that meets your needs.